As Laura Elkins watches her two daughters, ages 9 and 7, play in her backyard she doesn’t take it for granted. A few years ago, just letting them outside to play wasn’t really an option. Her oldest daughter, Brynn, is what Laura describes as a “bolter”…she just takes off at every opportunity. Brynn was diagnosed with autism at 3 ½ years of age. That’s when MRCI, a statewide nonprofit, was there to help Laura and her husband Dustin, navigate through the state system to make improvements to their home. Improvements designed to keep Brynn safe. When their daughter Sage was born with Down syndrome, Laura knew she needed more help in the home. Laura said that financially, the family could never have hired a caregiver on their own. Through MRCI, she enrolled in the PCA Choice program, benefits that help her hire one staff person at a time to help care for both girls. Direct support professionals have been an integral part of girls’ lives for more than five years. These are the individuals the Elkins family trust to care for their needs. Although they may be referred to in many different ways … as counselors, coaches, specialists … one sentiment truly defines them all: heart and soul. The technical term, direct support professionals (DSPs), just does not quite convey all they do, or the impact they make on people’s lives. The definition of a DSP is clear-cut: people who work directly with people with physical disabilities and/or intellectual disabilities with the aim of assisting the individual to become integrated into his/her community. What this really means is being there to help not only with physical needs, but with soft skills and life skills. The dedication shown by our DSPs to the people we support drives our success and helps fulfill our mission of providing innovative and genuine opportunities for individuals with disabilities at home, at work and in their community. The recruitment and retention of a qualified, competent DSP workforce is key as MRCI pursues its mission of community integration for individuals with disabilities. Each September, these individuals are honored during Direct Support Professional Recognition Week, a nationally-recognized endeavor. While MRCI tries to show our appreciation year round, this week is a time set aside to honor and thank the DSPs who are working hard every day to support people with intellectual and developmental disabilities. But they’ll tell you, they are rewarded year round by the clients they care for. And just as DSPs help us be successful, we in turn want to help them reach their goals as well. Case in point, Julie Lux. She now serves as strategic relations manager as she has utilized the extensive training and opportunities provided through MRCI to advance her career, but she started with MRCI 11 years ago as a direct support professional. “The most rewarding part is knowing you were able to help someone stay within their home and receive the care they need. Making the connection with the person served and their family. It really is a relationship you have for a long time. I still speak with families who were my first visits years ago,” said Lux. Stories like Julie’s are common among DSPs who get into the industry early. Working in this role can be very rewarding, said MRCI’s Aaron Clancy, who has been a DSP since 2010. “When I tell people I am a DSP, I often hear, ‘That must take someone with a big heart’,” he said. “But the truth is, it’s the people I support that have the big – bigger-biggest hearts to accept me. 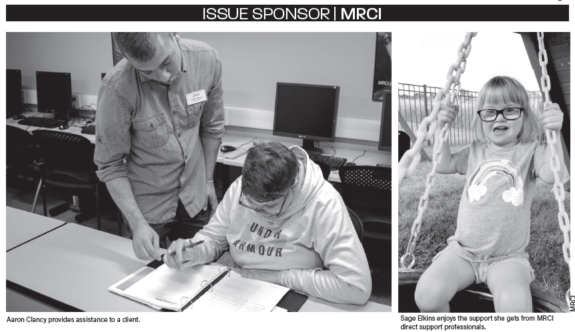 MRCI is proud to be supportive individuals at home, work and in the community. If you know of someone who would love to be inspired by one of MRCI’s clients working as a care provider please contact us at www.mrciworksource.org or call 800.829.7110.